KENNEDY SPACE CENTER, FL--Pending the completion of last-minute work and a final review, a commercial cargo ship making its maiden voyage to the International Space Station should be ready for launch April 30, officials said Monday. The long-awaited test flight is intended to clear the way for routine resupply missions starting later this year. Bill Gerstenmaier, director of space operations for NASA, said Space Exploration Technologies Corp. -- SpaceX -- has made steady progress working through exhaustive tests to make sure the company's Falcon 9 rocket and Dragon cargo capsule are ready for takeoff. "Everything looks good as we head toward the April 30 launch date, but I would caution us all that there's still quite a bit of work that needs to be done," Gerstenmaier told reporters after a joint NASA-SpaceX flight readiness review. "There are some things we've got to do on our side to validate some software and things after the SpaceX team completes (its work). "Our teams will have to go look at that data and then make sure that it's all OK," he said. "I think there's a good chance to make the 30th, we'll continue to work through this stuff over the next week or so. On the twenty-third of April we'll get back together again and just kind of assess where we are overall. But again, tremendous progress by the teams." For his part, SpaceX founder and chief designer Elon Musk, an internet entrepreneur and self-taught rocket engineer who has pumped more than $100 million of his own fortune into the company, thanked the space agency for sharing its expertise, saying "we wouldn't have gotten this far without the help of NASA." "I'd also like to express a note of appreciation to the American public, who are ultimately funding this," he said. "Just want people to know we've really done everything we can to make sure that this mission is going to go well. It's been a huge amount of hard work by the SpaceX team in partnership with NASA." Launch from complex 40 at the Cape Canaveral Air Force Station is targeted for 12:22:26 p.m. EDT (GMT-4) on April 30, roughly the moment Earth's rotation carries the launch pad into the plane of the space station's orbit. If the weather or technical problems force a delay, SpaceX can make another attempt May 3. After that, other missions -- a U.S. military launch May 5 and then a Russian Soyuz mission nine days later to ferry three fresh crew members to the space station -- likely would take precedence. Whenever it flies, the SpaceX flight plan calls for the Dragon capsule to first fly a complex loop around the station to demonstrate that the craft's navigation and abort systems work as required. Starting from a point 6.2 miles below and 37 miles behind the laboratory, Dragon's suite of flight computers will use data from navigation satellites to compute its position and maneuver itself to a point just 1.5 miles below and 25 miles behind the complex. A variety of tests will be performed before the Dragon drops back down to a point 6.2 miles below the station. Over the next day, the capsule will pull out in front of the station, loop up and over it and eventually return to a point 6.2 miles below and behind the laboratory. 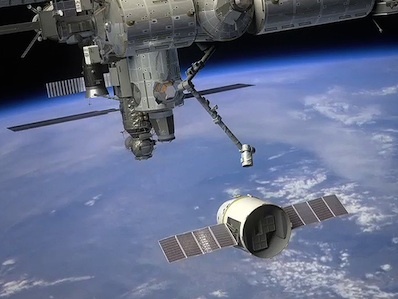 If all of that goes well, the Dragon spacecraft will be cleared to move in for berthing on May 3, flying a stepwise automated approach to hold points 1.5 miles and .9 miles directly below the station. Assuming all systems are operating normally, the capsule will move up to a point just 820 feet below the station for another series of controllability tests. Only then will Dragon be cleared to approach to within about 30 feet. At that point, rocket thrusters will be disabled and the lab's Canadian-built robot arm, operated by flight engineer Donald Pettit, will latch on. Pettit then will trade places with European Space Agency astronaut Andre Kuipers, who will use the arm to maneuver Dragon into position for berthing at the forward Harmony module's Earth-facing port. Pettit will make sure the common berthing mechanism operates as required to firmly lock Dragon to the space station. Hatches will be opened the next day. For its initial visit, the Dragon capsule will be carrying 1,150 pounds of non-critical equipment and supplies, including clothing and food for upcoming crews. If all goes well, Dragon will remained docked until May 21. At that point, the station's robot arm will unberth the capsule and then release it. Loaded with 1,455 pounds of hardware and other equipment needed back on Earth, the cargo craft then will execute a re-entry and splashdown off the coast of California later that day. "This is absolutely critical to space station," Gerstenmaier said. "We really need this cargo capability to be able to get to station and the return capability that Dragon provides is truly unique of any one of the cargo providers, including the Russians. The amount of cargo we can get back from Dragon is just phenomenal. So we absolutely need this capability for ISS and we're really rooting for the teams to come through." Launch originally was targeted for early February, but the flight was put on hold to give engineers more time to perfect flight software and complex abort procedures. The flight was delayed another month when engineers decided still more work was needed to eliminate potential problems. "As Elon said, this is really a tough flight," Gerstenmaier said. "What we're asking them to go do on this demonstration flight is amazing. ... All the hardware has to work and all the software has to interact and the six computers (in the Dragon capsule) and the 18 thrusters, and all this has to work as a nice, combined set to get into this precise box to be picked up by the (station arm), that is no easy task. "So this will be a very demanding mission and we need to look at it as a test flight. We'll see how well the test works out, but they've really done a good job getting ready." Headquartered in MacLean, Va., Orbital Sciences won a contract valued at $1.9 billion for eight cargo flights to the station. Another $288 million was budgeted for development and at least one test flight. An initial demonstration mission is planned later this year. SpaceX, headquartered in Hawthorne, Calif., holds a $1.6 billion contract to provide 12 cargo flights to the station for delivery of more than 44,000 pounds of equipment and supplies. The company initially planned three test flights under a separate contract valued at up to $396 million. The first flight was successfully carried out in December 2010 when a Dragon capsule was lofted into orbit and guided to a successful splashdown in the Pacific Ocean, the first commercial spacecraft ever recovered from orbit. As originally envisioned, the second test flight would have tested rendezvous procedures and included a close-approach to the station with berthing deferred to the third flight. But SpaceX successfully lobbied NASA to combine the second and third test flights into a single mission and that is the flight scheduled for April 30.